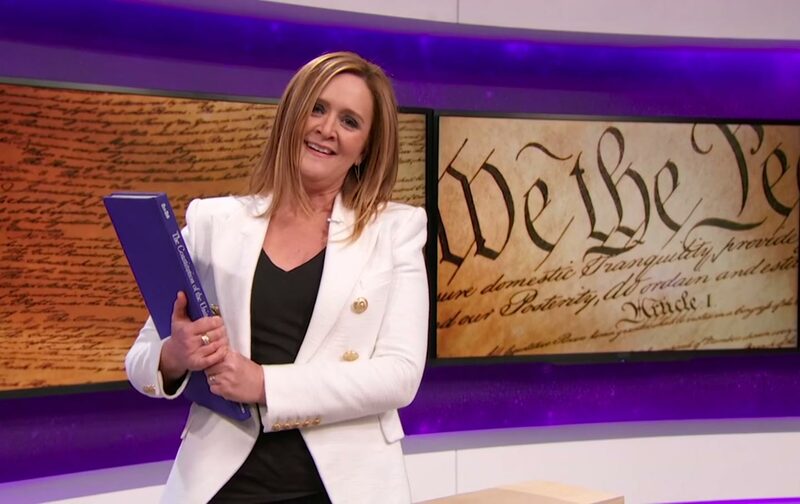 One ridicules the other mercilessly, but Samantha Bee and Hillary Clinton are nevertheless sisters-in-arms: each a strong, ratings-dependent feminist trying to break into an all-boys’ club, late-night comedy and the presidency, respectively. But only one of them is firing with all guns blazing. At 46, Bee is right on the cusp of the feminist generational divide that is plaguing Clinton’s campaign, especially after the Steinem/Albright New Hampshire meltdown. But as tough as she is on Hillary, Bee’s no Bernie Bro either (she hits Sanders for sporting sloppy clothes and too-neat remedies, telling him, “Money doesn’t fix racism, Bernie”). And in her own, extremely backhanded way, Bee has been giving Clinton some you-go-girl advice. On Full Frontal’s second episode, Sam said Hill can avoid the sexist traps awaiting her whenever she opens her mouth by writing reminders in Sharpie on her wrists: “SHRILL=BAD” and “DON’T BE C*NTY” (asterisk hers). Bee was never one of my favorite comedians on The Daily Show. Her mugging and delivery too often struck the same overacted one-note. She still does that stuff on her show, but she’s becoming something more. With the amplitude of 22 minutes and by emerging from Jon Stewart’s shadow, Bee is more full and frontal. It’s just her, alone, standing on a barren TV set that doesn’t even try to look like a fake news show—it has no desk, spinning graphics, or fellow correspondents. And, in something not seen on Stewart, Colbert (1.0 or 2.0), Noah, Wilmore, or Oliver, Full Frontal is all politics, no pit stops for celebrity interviews or pop-culture curios. That may all change one day. But for now, it’s just Bee, backed up by video, a throbbing theme song, Peaches’s “Boys Wanna Be Her,” and a bunch of writers—chosen, by the way, in a blind submission process, reportedly resulting in a writing staff that’s half female and more ethnically diverse than most joke teams this side of The Nightly Show. You get the idea: She discovers that they not only don’t hate us, but that they’re reasonable human beings and have a sense of humor! Well, at least they laugh at Bee’s jokes. Inevitably, Full Frontal will be caught up in the feminist angst Hillary’s campaign has unleashed. The question is, can Bee get a little more nuanced than doing witches and harpies? I’m trying to figure out how we can do that with Republicans. You know, we need to find that dog and follow them around, and every time they say things like, “Oh, the Great Recession was caused by too much regulation”—art, arf, arf, arf! You know, we could cut right through a lot of their claims. Of course, Bee could just ignore it. Or maybe she’ll see that Hillary was doing something quite Bee-ish: telling a joke and daring to cross a line of acceptable girl behavior. Maybe Bee will even bark with Clinton. Only louder.